Sanchit Art - The contemporary art place Sanchit Art was started in the year 2010 with an aim to promote Indian art at international level and expose the Indian artists to the International level art. The gallery has a physical presence in Delhi as well as Agra, whereas people across the globe can have an online access to their website. There was a time when contemporary art was given much importance. India has a rich history which can be portrayed through the medium of art. There are various talented artists whose work speaks on their behalf. Sanchit Art aims at adding difference to the lives of the artists by providing them a platform to showcase their work. Sanchit Art hosts many art related events where works of great artists are displayed. The art gallery also participates in international exhibitions for a wider exposure. There are various artists who have associated with this art gallery as it is highly reputable and trustworthy. Most of the work can be seen online and the art lovers can make an instant purchase. It also has a tie-up with the media where the audiences are kept informed regarding their events and new arrivals. There is no entry fee for the public. It is open on all the days except Sundays. The visiting hours are between 10.00 am to 7.00 pm. If art is a stress buster for you, Sanchit Art is a must visit place. The collections are sure to keep you mesmerized. Poetry is considered the crown of literature. Being poetic is more of a condition, a state of living, than a profession. The importance of poetry and literature has been ever increasing since the last three years in Delhi. It can be the most freeing of art forms. Shown below are some of the literary reading and poetry performing clubs steadily on the rise in Delhi. Poets Corner is an idea that attempts to bring in a fresh wave of life in literary circles, with special focus on the art of poetry.Founded in 2012 as a not-for-profit, non-governmental organization, we have been at the vanguard of promoting and celebrating poetry in a myriad of activities, both offline as well as online. With a Facebook group membership that exceeds 23,000 poets across 21 countries, Poets Corner counts itself amongst one of the leading literary and specially, poetry groups in the country. As a prolific & responsible literary organization committed to revive and promote the dying art of poetry in India, we have published 22 anthologies featuring over 400 poets so far, 150 of which are previously unpublished, creating a platform for unpublished & emerging poets to be published alongside celebrated poets. Our next 2 anthologies are ready to be released at our forthcoming Delhi Poetry Festival, Season 3.Headed by Dolly Singh, it envisages reviving, re-fueling and taking poetry to its rightful place — in the hearts and minds of people. Based out of New Delhi, DelSlam produces spoken word festivals, artists and education in the capital. We host six exclusive shows every year with groundbreaking productions by international and rising slam poets. The stage has invited celebrated performing artists such as Jamaal Jackson Rogers from Ottawa, Easterine Kire from Norway, Melizarani T. Selva from Malaysia and Alok-Vaid Menon from New York. DelSlam takes pride in bringing the international spotlight to New Delhi in the field of spoken word and performing arts. Since 2013, DelSlam has led arts education and mentorship for rising poets and writers in universities and schools. It encourages all forms of poetry, be it in Hindi or English. This organization also hosts workshops for aspiring poets and writers, such as the Delslam Summer Camp. Delhi Poetry Slam is located at Korean Cultural Centre, A-25 Lajpat Nagar IV New Delhi- 110024. Started by Raghavendra Madhu, this one-year-old initiative is an endeavor to provide free cultural spaces to artists and lovers of poetry and revive this forgotten art. With the closing down of book stores, and the emerging of e-spaces, he seeks to revive the old caf� house culture where platforms conducive to open interactions were provided for. Hence was started Poetry Couture in Flaming Chilli Peppers restaurant in Vasant Kunj, New Delhi. With almost regular Poetic-Addas and Fresh-Leaf readings, this platform has already created for itself a comfortable niche in the cities of Kolkata, Mumbai and Delhi. This is mostly for the youth to engage with poetry intrinsically, and to create a space where one can practice one’s right to free speech. They generally read at cafes and parks. They have come up with events and sessions that deal with social malpractices and customs. The (Great) Indian Poetry Collective is the coming together of poets who believe words can transform lives. Founded in 2013, in Bangalore, India, as a not for profit poetry collective, The (Great) Indian Poetry Collective strives to publish poetic voices from India that are innovative and diverse. Through a shared process of editing, layout & design and publishing, members of the collective will support one another in producing beautiful poetry books, chapbooks, and anthologies. But it doesn’t end there. The (Great) Indian Poetry Collective believes each poem initiates a dialogue with society and the greater world. Through poetry readings, workshops, and lecture/demonstrations, they want to build a community in which artistic expression leads to positive action. Poetry with a purpose. It is a mentorship model literary press, bringing new poetic voices from India to the world. They are a not-for-profit, shared work literary press publishing and promoting poets with a connection to India/Indian subcontinent. A typical evening at the Poetree starts with a round of introductions over-fittingly-coffee. The featured poet of the night ambles up to read some of his best works. Others who want to recite write their names in a book being passed around and wait their turn. The poetry, both in style and substance, recognises no boundaries. Urdu verses give way to haiku, romantic ramblings to impassioned addresses to society. "We are looking for original talent in the city. Everyone is welcome to visit and read out their poetry," says Amit Dahiyabadshah, poet and founder of the Delhi Poetree. The target, according to Dahiyabadshah, is threefold: to "refine the crude and rootless population of the city, identify and edify 100 unsung poets and, finally, help them get published and sold." 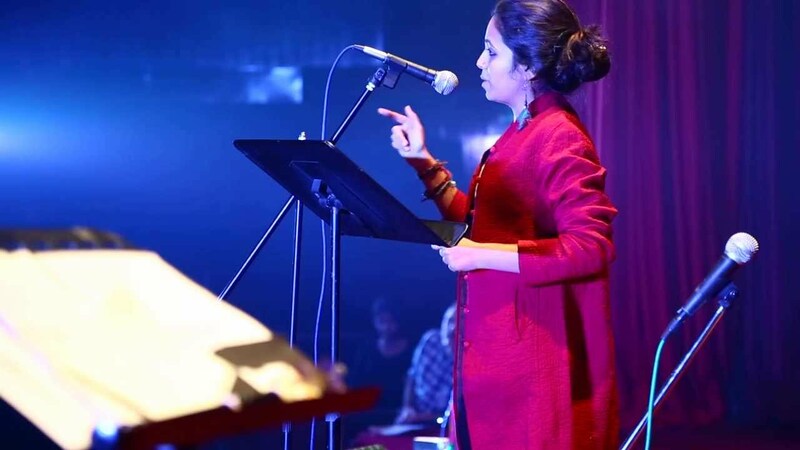 Adds member Shikha Khanna: "Besides the fact that there is no other open platform for original poetry in Delhi, the Poetree also brings together enthusiasts and gives everyone a chance to shine." In keeping with the romantic notion of poetry as a catalyst of change, those at Poetree are working towards social reform and have collaborated on a book of easy verse for street children. "We believe that poetry can save society and revive the sense of community," says Dahiyabadshah. They say one poet can cause a revolution; imagine what a city of poets could initiate. Hence, it is clear that despite the struggle of poetry to survive in other places, Delhi remains a city where poetry is still considered a remedy for the soul. India is a land of art and culture and there are various forms to it. Be it dance, theatre or painting, you will definitely find institutes that nurtures and hones the skill of artists. And one such centre is Indira Gandhi National Centre for the Art. It was established in the memory of Smt.Indira Gandhi as art plays an integral role in personal development as well as the development of the society. The Indira Gandhi National Centre for the Arts, is a major resource for all thos who has a flair towards art and culture. Initially, the centre targeted on the development of the nation, and projecting the country's’ rich culture and heritage. However, later on it expanded its horizons and to other culture and civilizations. The Indira Gandhi National Centre for the Arts, was started in the year 1985 and the trust was registered in the year 1987. It aimed at undertaking many research programmes and take them to a different level altogether. It also had a long term goal to promote art with national and international institutions. Be it photography, paintings, theater, architect, visual images, sculpture or ny form of art, the students are definite to find out the best resource at The Indira Gandhi National Centre for the Arts,. The students no longer has to disappointed to find out the perfect place to hone their artistic skills.